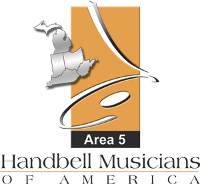 Area 5 is a regional subset of the Handbell Musicians of America (HMA), a national non-profit organization dedicated to advancing the musical art and excellence of handbells. The Area 5 region is comprised of Indiana, Kentucky, Michigan, Ohio, and West Virginia. For more information please take a look around this website, and feel free to reach out to our Board members with any questions. We’re here to serve you! Handbell Musicians of America is dedicated to advancing the musical art of handbell / handchime ringing through education, community, and communication. We listen and respond to the needs of the handbell community within our five-state Area. We strive for musical excellence at all skill levels. We include all ages, backgrounds, and interests. We endeavor to be a diverse community. We create partnerships with those who share our goals and values. We act as responsible stewards of resources placed in our care. Handbell Musicians of America is the national organization devoted to uniting people through the musical art of handbell and handchime ringing. As the principal voice for this medium we envision a community in which handbell musicians of every skill level realize their full potential through mentorship, education, and events. We envision our members uniting with others to create a world in which the art form is musically respected and has universal appeal.